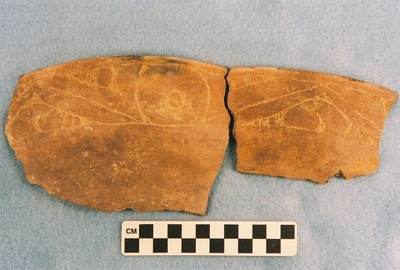 "41CP12, Burial 35, Pot 1" by Timothy K. Perttula and Robert Z. Selden Jr.
DECORATION: The rim has an engraved circle and nested triangle motif repeated four times around the vessel. The engraved circles each have a small central and open circle within them, and the nested triangles have a large oval defined by excised lines; the oval has a central spur element. A white kaolin clay pigment has been rubbed in the engraved lines. Ripley Engraved, var. Cash carinated bowl, Burial 35, Pot 1.